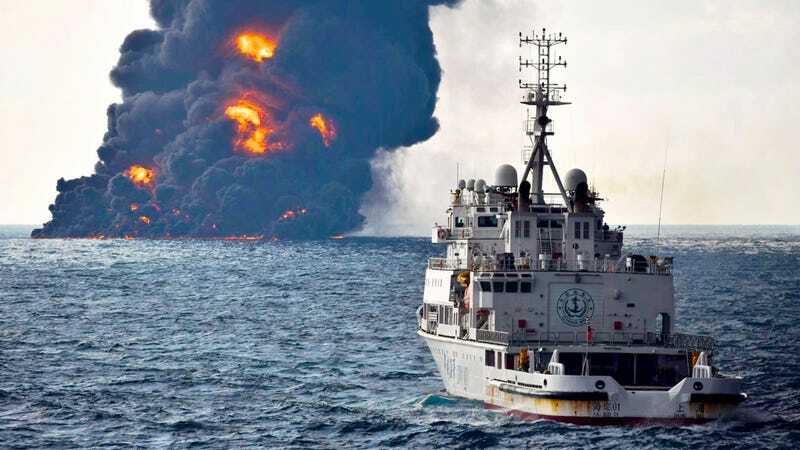 After burning for nearly an entire week, the Sanchi oil tanker has finally plunged to the bottom of the East China Sea. A large, toxic oil slick now threatens the region, with models suggesting it won’t reach land for another three months. As reported in the BBC, the slick now measures 46 square miles (120 square km), doubling in size from just yesterday. The slick is primarily comprised of the heavy fuel that was used to power the vessel, but the Sanchi’s cargo—136,000 tons of ultra-light crude oil from Iran—has likely leaked from the sunken ship as well. 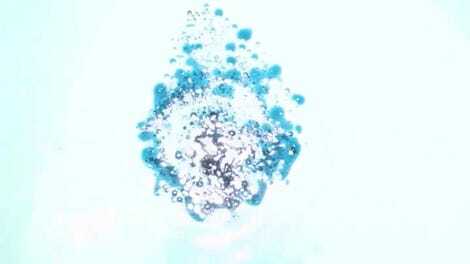 This crude condensate, which is used to make products like petrol, jet fuel, and heating fuels, is colorless and odorless, but more flammable than conventional oil. This form of crude is not easily detectable, and the wreck could be producing a giant and toxic underwater slick. Both the ship’s fuel and the condensate could harm marine life. The Sanchi collided with a cargo ship on January 6, about 160 miles (260 km) off the coast of Shanghai. All 32 crew members were killed in the incident. Some bodies were airlifted from the beleaguered vessel before it sunk over the weekend. The cause of the collision is still unknown, but the ship was in waters not typically traversed by large vessels, which tend to travel closer to the Chinese coast or nearer to Japan. So what was a frantic search and rescue mission has now turned into a clean-up operation. The Sanchi sunk on the border of the East China Sea and the Yellow Sea, and the slick now threatens the coasts of China, South Korea, and Japan. A fire on the water was recently extinguished, and ships are now spraying the surface with chemical agents to dissolve the oil. Computer models run by the National Oceanography Centre and the University of Southampton suggest the slick will reach the Korean coast, but not for another three months. The ultimate fate of the oil is still not known, as it could evaporate (a distinct possibility given its low density) or it could mix in with the ocean water for a prolonged period. This ocean region features complex, strong, and high variable surface currents, making predictions difficult. Also, officials aren’t entirely sure how much of the Sanchi’s crude condensate has spilled into the sea, and given that spills of ultra-light crude condensate are rare, it’s difficult to know how it will evolve from here. The researchers used a computer model called NEMO to simulate the slick. They ran multiple simulations, each with slightly different variables. The results varied significantly, so the researchers aren’t entirely certain how the slick will move, or where it might reach land. Suffice to say, this story is far from over.